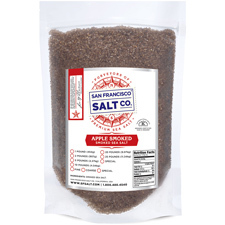 Smoked Applewood Sea Salt Coarse Grain | S.F. 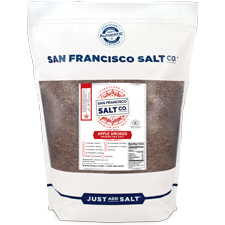 Salt Co.
Add a sweet and savory touch to your dishes with this delectable smoked salt. Smoked Applewood Sea Salt is made with pure sea salt that has been slowly smoked above an Applewood fire - a centuries old process. Enjoy it on meat, seafood, soups, salads and more. Use our Smoked Applewood Sea Salt whenever you want to add a sweet,smoky flavor to your dishes - without harshness or bitterness. Also available in Fine Grain. DESCRIPTION - Applewood Smoked Sea Salt is made with pure Pacific Ocean Sea Salt that has been slowly smoked above an authentic Applewood fire. Packaged in our U.S.A., GMP certified packaging facility, which is 3rd party audited by SCS Global. 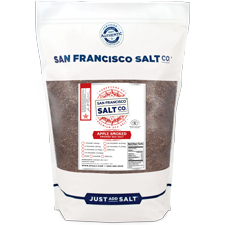 PROPERTIES - Our Applewood Smoked Sea Salt is non-GMO and does not contain any MSG, Soy, Gluten, Dairy, or anti-caking agents. Crafted in the USA.